Prepare veggies: slice zucchini, cut bell peppers and red onions into squares. Make sure every ingredient is cut to about the same size. 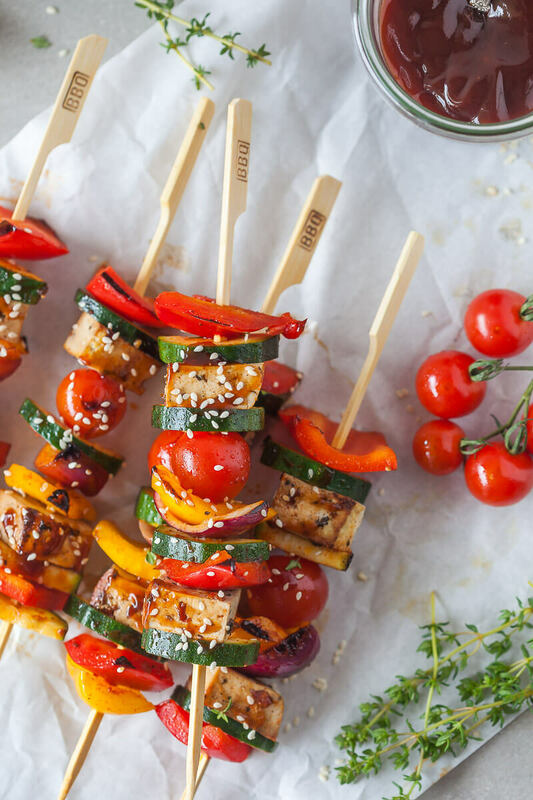 Assemble skewers: stick vegetables and tofu alternately on bamboo sticks until you have used up all your vegetables. Heat a pan, grill pan or grill until sizzling hot, grease with some olive oil and then place skewers in and cook for a couple of minutes on each side, until the vegetables turn softer, but not mushy and the peppers start getting a char. The tofu should be golden brown. Season with salt and pepper right at the end of cooking, then brush with barbecue sauce and sprinkle with sesame seeds. Remove from pan or grill and serve hot.